Home » Bleeding » Chest Seals vs Occlusive Dressings: What's the Difference? Chest seals are used to treat deep cuts or puncture wounds in the chest, abdomen, and neck. 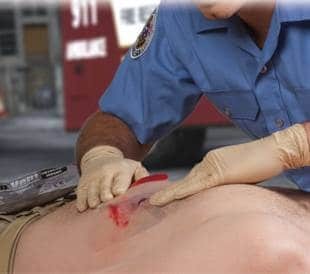 Although severe traumatic injuries are not common in daily civilian life, a good first aid kit should still be prepared to deal with any injury because cheap, simple, pocket-sized tools can potentially save lives. The most common cause of severe trauma is vehicle accidents; in 2015 over 38,000 people died in car accidents in the united states. According to the National Institute of Health about 25% of these deaths are caused by collapsed lungs which can be prevented using chest seals. Chest Seals & Occlusive Dressings: What's the difference? Occlusive dressings are any bandages that create an air-tight and water-tight barrier over a wound. They can be anything from a piece of plastic with tape, to petroleum soaked gauze, to surgical glue. Chest seals are a type of commercial occlusive dressing designed to treat punctured lungs, traumatic abdominal injuries, and cuts to the jugular veins or carotid arteries. One side has a powerful adhesive that is designed to stick to patients regardless of blood, sweat, hair or anything else that might be on them. The other side is either smooth or has a 1-way air vent. Vented chest seals are specifically used to treat punctured lungs while non-vented chest seals are used for everything else. If there is a deep cut, puncture wound, or bullet hole between the navel and the neck it’s considered a chest injury. Deep chest injuries have a good chance of puncturing one of your lungs because your lungs make up a large part of what’s inside your chest. When a lung gets punctured, air builds up in the pleural cavity between the lung and the chest wall causing the lung to collapse. This life-threatening condition is called a tension pneumothorax. A tension pneumothorax is treated using a vented chest seal. An occlusive dressing can also be used for immediate relief, but complications develop if it's left in place for a long time. A vented seal allows the air to escape from inside the chest when you exhale without letting air back in when you inhale. This prevents air from building up and collapsing your lung. Tension pneumothoraces are often characterized as sucking chest wounds because air is pulled in through the hole in your chest making a sucking noise. It’s important to note that not every tension pneumothorax will make this sucking noise. If a patient with a chest injury is having trouble breathing, it’s another good sign that they may have a punctured lung. In an emergency it’s not your job to diagnose what’s wrong. If you think there might be a problem, treat it. If the abdomen gets cut open or punctured to expose the organs underneath it is called an abdominal evisceration. When this happens the organs should not be put back inside the body and anything stuck in the wound shouldn’t be removed. Wet the appropriate amount of sterile gauze with saline solution if possible or water otherwise. Cover the gauze with an occlusive dressing, and get the patient to the hospital as soon as possible. Hemostatic gauze and direct pressure can be used to control bleeding if necessary. A cut to the neck can damage your major veins, arteries, or airway. If the major arteries and veins are cut, use hemostatic gauze and direct pressure to stop the bleeding. When the bleeding is under control use an Israeli pressure bandage wrapped under the armpit to maintain pressure. A tourniquet will not work on the neck. If the airway is cut open and air or bubbly blood is coming out, use sterile gauze to stop the bleeding, then cover it with an occlusive dressing. This description does not cover blunt force trauma to the neck. For a description of how to treat possible spinal injuries see our section on SAM splints. In an emergency it is possible to improvise a chest seal using the packaging from quikclot and tape, but it takes time and usually has problems sticking to the patient. Commercial ones, in contrast, are designed to stick to anything. Clean and dry the area around the wound as much as possible before applying the chest seal. Cover the wound with moist sterile gauze to stop the bleeding. Then cover both the gauze and the wound with the occlusive dressing, and press the occlusive dressing into place to create a firm seal. 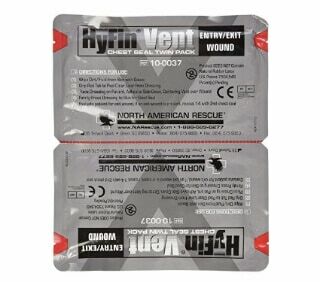 If this is being used on a chest injury, wait until the patient breathes out or ask them to cough before applying it. This will decrease the amount of air trapped inside the chest. Vented chest seals should only be applied to chest wounds, not abdominal or neck injuries. Make sure that the vent is centered over the wound. You don’t need to worry about having the patient cough when using it as the vent will continuously let out trapped air and blood. Do not cover the wound with gauze before using a vented chest seal. The easiest way to seal a punctured lung is to put the palm of your hand right on top of the wound and hold pressure. To simulate a vented chest seal, seal the hole when the patient breaths in and uncover the hole when the patient breaths out. If the patient is conscious and the hole is easy to reach, you can have them cover it as well. Place the wrapper, sterile side down, on the wound. Tape the wrapper down using the stickiest tape you have, and don’t be afraid to wrap the tape all the way around your patient. The patient will most likely be bloody and/or sweaty, so this is no time to be frugal with your tape. Get it to stick by any means necessary, and get the patient to a hospital. Some sources say to tape 3 sides of the wrapper to make a 1-way/flutter valve, but anyone who has tried this knows it’s futile. Cover every hole. If there is an entry wound, is there an exit? Leave diagnosing to doctors; if you're unsure, treat it like the worst case scenario. With an unvented chest seal or occlusive dressing, wait until the patient breathes out before applying. When improvising one don’t be afraid to wrap tape all the way around your patient. It needs to stick. If you’re using an unvented chest seal/occlusive dressing and your patient’s breathing becomes more labored as time goes on you can cover the wound when they breathe in and uncover it when they breathe out. This will act similarly to a vented chest seal. Noppen M, De Keukeleire T (2008). "Pneumothorax". Respiration. 76 (2): 121–7. doi:10.1159/000135932. PMID 18708734. "Abdominal Trauma | Emsworld.Com". EMSWorld.com. N. p., 2016. Web. 3 Oct. 2016. "Neck Trauma Treatment & Management: Prehospital Care, Emergency Department Care, Consultations". Emedicine.medscape.com. N. p., 2016. Web. 3 Oct. 2016. Sharma, Anita, and Parul Jindal. “Principles of Diagnosis and Management of Traumatic Pneumothorax.” Journal of Emergencies, Trauma and Shock 1.1 (2008): 34–41. PMC. Web. 11 Jan. 2017. "Motor Vehicle Deaths Increase By Largest Percent In 50 Years - NSC News Releases". Nsc.org. N. p., 2017. Web. 11 Jan. 2017.